This is an aesthetic, multi-use recreation trail located at the confluence of the Kaskaskia and Mississippi rivers featuring several natural and cultural educational/interpretative areas and opportunities. 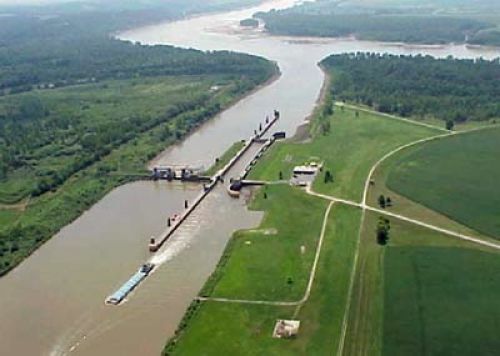 Location: On U. S. Army Corps of Engineers managed public lands at the Kaskaskia Lock and Dam site near Modoc, IL, and one hour south, south of Kaskaskia Lock and Dam along west side of Kaskaskia River at Mississippi River. From State Route 3 in Ellis Grove, turn on to Roots Road, go 5 miles west. Turn south onto Lock and Dam Road for 3 miles, and then a left at Lock and Dam entrance. Proceed to downstream boat ramp access area for trailhead. The trail is located entirely on U.S. Army Corps of Engineers Federal public lands at the Kaskaskia River Lock and Dam site located at the confluence with the Mississippi River, north of Chester, IL. This area is at the heart of the French Colonial region (1600-1700's) in southwestern Illinois, on the shores of the Mississippi River, a nationally significant environmental and economic great river resource. This area has many valuable natural, historical, and economic resources. Selected points of interests in the area also include Fort de Chartres (Prairie du Rocher, IL), George Rodgers Clark and Long Knives captured Kaskaskia, Fort Kaskaskia/Pierre Menard Home (Ellis Grove, IL), Kaskaskia Liberty Bell (Kaskaskia Island, IL), Lewis and Clark Expedition (county wide) and Middle Mississippi National Wildlife Refuge operated by the US Fish and Wildlife Service. Regionally its location is just an hour south of St. Louis, MO and an hour north of Carbondale, IL and is easily accessible to visitors from state and local highways. This aesthetic, multi-user trail and educational/interpretative area at the confluence of the Mississippi and Kaskaskia River is an excellent site for recreation, and to promote the rich river history (natural and cultural), and other interpretive and educational opportunities such as the river navigation shipping and its history and economic significance. Kaskaskia River Project has completed a trail through a high quality bottomland forested area from the Kaskaskia Lock and Dam lower boat ramp/campground area to the confluence with the Kaskaskia and Mississippi Rivers passing by wildlife food plots maintained by the Corps personnel. The trail is graveled and is accessible from a parking area at Kaskaskia Lock and Dam downstream boat ramp. This trail can be used for walking, bicycling, jogging, and educational and/or interpretative programs given by local partners and Corps staff. The length of the trail is approximately .4 mile one way, with a width of 12 feet (a future trail loop expansion is being planned) to allow for service/maintenance access. A vault toilet is being installed next to the trail head and parking lot area for visitors and will be maintained by the Kaskaskia River Project. The highlight of this trail is access to the shoreline at the confluence of the Kaskaskia with the Mississippi River. This is the only public river access site on the banks of the Mississippi River for 100 miles in the State of Illinois. It is a point that can be used for reflection or education. Picnic tables and grills are provided. Flood proof/removable trail Interpretive signage/exhibits and brochure are being developed, and a stone amphitheater with seating for approximately 60 people is being constructed on the high bank of the river at the confluence with large (2'x3') locally quarried limestone blocks to serve as seating and a large stone fire ring. All of these improvements are being accomplished in partnership with several non government organizations. This area will be used for hiking, sight seeing, picnicking, watchable wildlife, education, interpretative programs and special events.